From left: Sarah Webber, professor, University of Dayton; Grace Moriarty, scholarship recipient, University of Dayton; Kori Mulligan, scholarship recipient, Capital University; Frances E. Klein, scholarship recipient, Xavier University; David Randolph, professor, Xavier University; Noah James Marcum, scholarship recipient, Northern Kentucky University; Bob Salyer, professor, Northern Kentucky University; Erin Schnell, scholarship recipient, Ohio State University; and Schnell’s father, Kevin. The Cincinnati-Columbus Chapter held its 2017 Student Night on Monday, November 13. James D’Ippolito, the Chapter’s academic committee chair, awarded scholarships to students from the University of Dayton, Xavier University, Northern Kentucky University, Ohio State University, and Capital University. 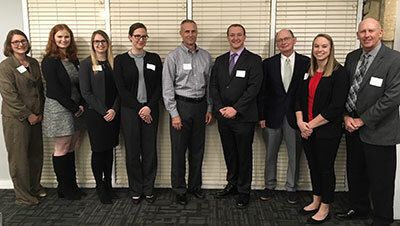 On Student Night, a longtime tradition of the Cincinnati-Columbus Chapter, scholarships are awarded to high-performing students who have expressed their intent to pursue a career in tax. The Chapter funds its scholarship program through its annual summertime Scholarship Golf Outing.